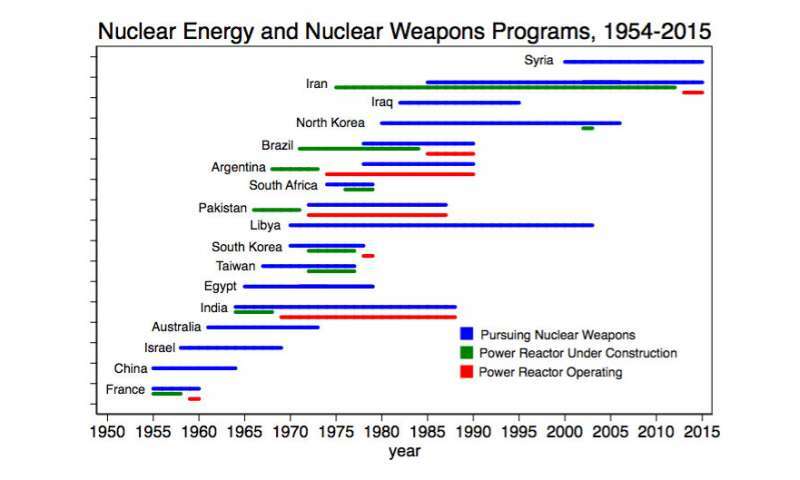 The Nuclear energy & nuclear weapons programs, 1954-2015. Credit: Figure provided by Nicholas L. Miller. In a historical analysis of the relationship between nuclear energy programs and proliferation from 1954 to 2000, the study finds that the link between the two has been overstated. Out of more than 15 countries that have pursued nuclear weapons since the first nuclear power reactor came online in the 1950s, only five—Argentina, Brazil, India, Iran and Pakistan—began pursuing nuclear weapons after a nuclear energy program had already been initiated. Most countries either pursued nuclear weapons following a more covert approach or had already begun seeking nuclear weapons before they had started nuclear energy programs. Moreover, countries that pursued nuclear weapons under the cover of an energy program have not been significantly more likely to acquire nuclear weapons, when compared to countries that seek nuclear weapons without an energy program. "The findings suggest that international efforts to manage the proliferation risks of nuclear energy programs have been quite effective," says author Nicholas L. Miller, assistant professor of government at Dartmouth. "Even when countries become more technically capable of developing nuclear weapons due to an energy program, they can often be restrained by timely intelligence and the prospect of sanctions." For nuclear cooperation agreements, Miller calls on the U.S. to forego a demand for the "gold standard" in which recipient countries must pledge not to pursue enrichment or reprocessing. This stringent requirement may scare off potential buyers, who then take their business elsewhere, which in turn reduces the United States' potential for leverage. While the U.S. should continue to oppose the spread of enrichment or reprocessing technology, it can pursue this objective via more effective strategies, such as consultations with other nuclear suppliers and quiet but forceful diplomacy with countries attempting to acquire this sensitive technology. Can we track the world's nuclear weapons?